Use your Hisense F20 Dual-SIM now outdoor at the beach, jogging etc. In our waterproof shell the smarpthones is protected against all environmental influences. • PROTECTION: The cover protects from dust, and splash water. Even if the phone falls into the pool, no water will enter. • FUNCTIONAL: By Touch-sensitive material, you can use your cell phone in the case. Through the headphone inlet you can connect your headset, which is included in this set. You can relax on the beach listening to music. Your Hisense F20 Dual-SIM is always protected. • UNIVERSAL: The shell is also ideal for any other smartphone, camera, GPS etc. or simply for your wallet, keys and cash. 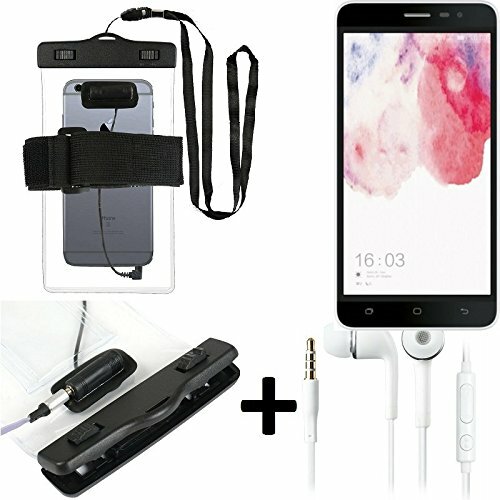 Suitable for all common smartphones, like all Apple iPhones, Samsung Galaxys all, all Sony Xperias, all Nokia Lumias, all Wikos, all HTC desires etc. • JOGGING BRACELET: With the arm loop you can use the shell as a waterproof bracelet while jogging. So no rainwater comes to your smarpthone.